“Green” lasagna, made with pesto and spring asparagus. Use green (spinach) noodles for St. Patrick’s Day. Photo courtesy Eataly | Chicago. Have you ever had green lasagna? We order lasagna every time we see it on a menu, trying to find one that’s better than Mom’s (which has only been bested once). We find them with the mainstay tomato-meat sauce, southern Italian-style; and with béchamel, a white sauce preferred in Tuscany and Emilia-Romagna (and preferred by us). 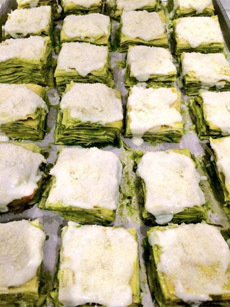 But in Liguria, the home* of basil, they use pesto for the sauce, creating a green lasagna. 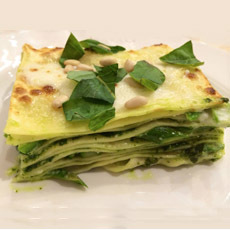 While basil is available year-round, take advantage of the spring harvest and make a green lasagna with other spring treats: asparagus, fava beans, fiddleheads, morels, ramps, and of course, green lasagna noodles instead of the conventional white. Here’s a recipe from chef Mario Batali, an owner of the Italian food experience that is Eataly. In Italian the recipe is called Lasagne al Pesto con Asparagi: Lasagna with Asparagus and Pesto (and anything else you want to add). In this recipe, Chef Batali makes four personal lasaganas in gratin dishes, instead of one large, rectangular casserole as shown in the photos. *Basil may actually be native to India, where it has been cultivated for more than 5,000 years. †Pecorino sardo, also known as fiore sardo, is a firm cheese sheep’s milk cheese from the Italian island of Sardinia. It’s sold at Eataly; but if you can’t get it, use Pecorino Romano instead. Here are the main Italian grating cheeses. 1. MAKE the pesto. In a large stone mortar, combine the pine nuts, basil, garlic and salt and grind with a pestle until it forms a paste. Add the cheeses and drizzle in the olive oil, beating with a wooden spoon. This can be made in advance and stored in a tightly-capped jar in the fridge, topped off with a layer of extra virgin olive oil. 2. BRING 6 quarts of water to a boil and add 2 tablespoons of salt. Set up an ice bath next to the boiling water. Boil the asparagus for one minute. Remove the asparagus, retaining the water in the pot, and refresh in an ice bath. Remove the asparagus from the ice bath, drain well, cut into ½-inch to 1-inch pieces on a bias and set aside. Pesto lasagna is sold by the piece at Eataly. Photo courtesy Eataly | Chicago. 3. DROP the lasagna sheets into the same boiling water as the asparagus. Cook one minute until tender. (If using dried lasagna, cook according to package directions.) Remove and refresh in the ice bath. Drain on towels and set aside. 5. HEAT the milk in a separate pan until just about to boil. Add the milk to the butter mixture 1 cup at a time, whisking continuously until very smooth and bring to a boil. Cook 30 seconds and remove from heat. Season with salt and nutmeg and set aside. 6. PREHEAT the oven to 425°F. 7. ASSEMBLE the lasagne. In a mixing bowl, stir the besciamella and pesto together until well combined. Butter 4 gratin dishes and place one piece of 5-inch pasta on the bottom of each one. 8. TOP the pasta with some pieces of asparagus, followed by 2 tablespoons of pesto, followed by another piece of pasta. Continue with this layering until you have 4 pieces of pasta and 4 layers of asparagus and pesto mixture. Lay one more piece of pasta on top, followed by a spoonful of pesto mixture and sprinkle each of the 4 gratin dishes with bread crumbs and the Pecorino Sardo. 9. PLACE all 4 dishes in the oven and bake for 12 to 15 minutes, or until bubbling and golden brown on top. Remove and serve immediately.